Right on the heels of the Illinois change to permit the automatic transfer of juvenile cases to adult court upon the age of 15 for the defendants comes the recent announcement that the defendants in the infamous ‘Slenderman Stabbing’ case are also being tried in an adult court. This seems at odds with advocate and legislature calls to reform the juvenile justice system. More and more teens and pre-teen defendants are facing adult sentencing than ever before. How can the two initiatives, seeming to be moving in opposite directions, be occurring at the same time? While the courts have become adept at processing drug related juvenile cases and the juvenile justice system has made strides towards offering better rehabilitation services for kids with drug related issues, the nature of major crimes committed by minors has changed. There are more striking examples on the docks today that tell a story of juvenile serious mental illness than suggest the traditional broken home and drug addiction path of before. Slenderman’s defendants, two 13 year old girls who stabbed a classmate multiple times in order to prove their worth as real world proxies for a fictional character, is just one of the most visible cases where issues of SMI are playing a role. The juvenile courts may not be adequately prepared or have precedent to handle cases in which the treatment of SMI may play a critical role. 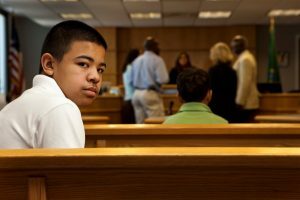 What are the main differences between SMI sentences in juvenile and adult courts? As was also demonstrated by the recent release of the brother and sister team in Florida who murdered their parents because they came of age, the limits of the juvenile court system lies in the years in which it can govern. Upon reaching age, the defendant is released. With a greater recognition of how serious mental illness evolves from childhood on, many advocates are supporting the transfer of SMI related juvenile cases to the adult court system. In the adult court system, the defendant can be mandated to treatment for an indefinite period. Release is contingent on the remission or elimination of symptoms. That may also open the door to later criminal proceedings, but most cases accept criminal sentencing in conjunction with committed mental health treatment. Is this the right way to treat youthful offenders with SMI? That is always the question and there is no real answer for it. The diagnostic criteria and diagnosis themselves have also recently changed with the release of the latest addition of the DSMV. The correctional industry is struggling to deal with higher rates of prisoners with SMI and those with dual diagnoses as well. The problem really is that the justice and penal system is based upon a punitive measure that has a beginning and end. SMI does not have a similar time period of activation. Finding appropriate ways to punish criminality in the short term while providing long term care is difficult. No more so than with juvenile offenders whose onset of SMI symptoms may not even be fully realized. Is the transfer worth it for your client? This is another tricky issue. There are other recent precedents that are working to redefine the nature of client confidentiality. A recent case saw a limit placed upon attorney discovery. If you discover something about the nature of your client’s mental health without their admission, you are now allowed to enter that into the court record for consideration with or without the client’s permission. While that can open the doors to providing greater care, it can be a hard sell to the guardians of an underage defendant. In the end, the tide is changing towards how juvenile defendants with SMI are handled – but no one knows for sure if it is for the best.